It's 10:52 in Trieste, Italy right now. Livestream Piazza Unità d'Italia Stunning view of the largest sea-facing square of Europe. Trieste: Webcam Radio Punto Zero, 0 miles away. 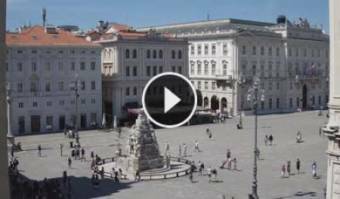 Trieste: HD Stream Borsa Square, 0 miles away. Izola: View from the Belvedere Hotel, 10 miles away. Portorož: Portorož Airport LJPZ, 12.9 miles away. Portorož: Livestream Beach, 12.9 miles away. Portorož: Panorama Adriatic Sea, 12.9 miles away. Portorož: View from the Hotel Histrion, 12.9 miles away.